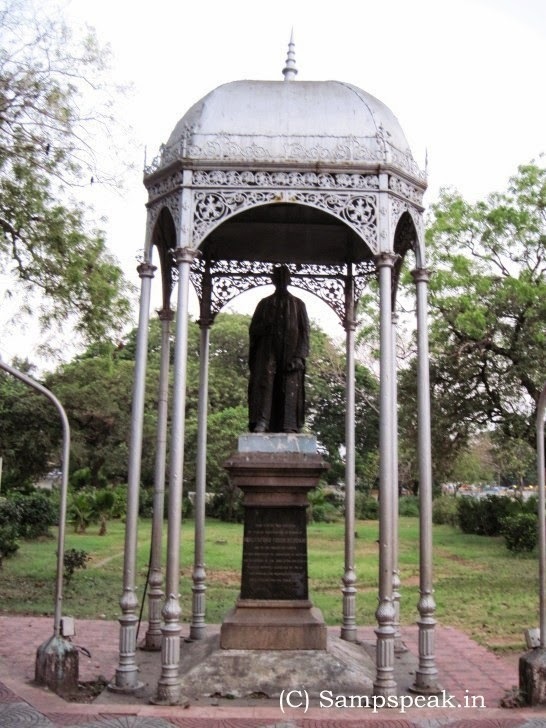 "Sampath Speaking" - the thoughts of an Insurer from Thiruvallikkeni: Justice H Tudor Boddam - the statue with a canopy - at May Day Park !! 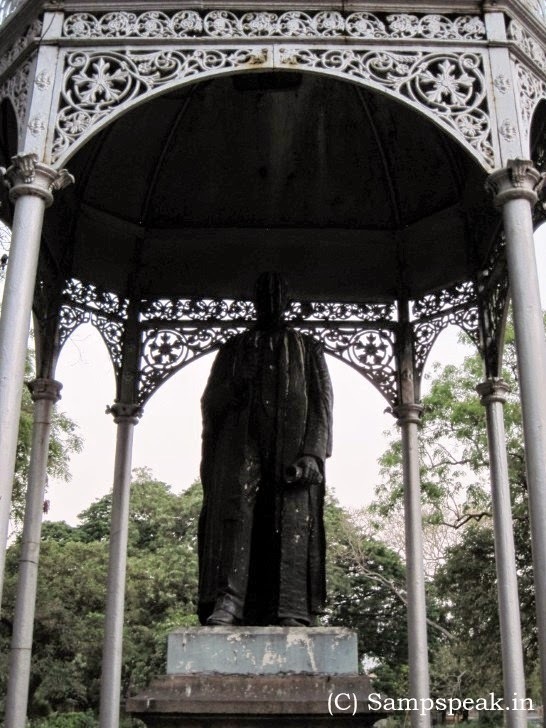 Justice H Tudor Boddam - the statue with a canopy - at May Day Park !! On the beautiful sands of Marina, scores of statues dot … some known and some not so well known ! – there are many more in prominent places of Chennai …. Some colonial vestiges – here is something that stands with a canopy protecting from rain, sunlight and bird droppings… unlike many others which lay in shatters uncared for ! Nearer the Hindu Office / P.ORR Sons at Mount Road, on the road leading to Chintadripet is the ‘May Day Park’ originally ‘Napier Park’ – the road is now named as (Deputy Mayor) Kabalamoorthy Road. Way back in 1869 by way of a resolution passed by the Madras municipality, the park was constructed and named after Francis Napier, 10th Lord Napier, the Governor of Madras at the time of its creation. The park covers about 14.5 acres. Public meetings and rallies especially on May day commence here. The Park is busy in the mornings and evenings attracting walkers. 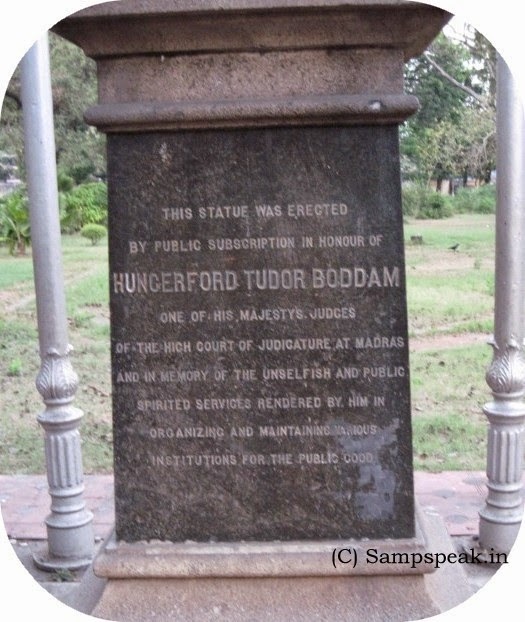 The etchings on the stone read it to be of Justice Hungerford Tudor Boddam of High Court of Judicature, Madras – erected with public subscription, unveiled by Sir Arthur Lawley, Governor of Madras in 1911. Read that the statue was once in Mount Road opp to Gymkhana club, nearer Pallavan Salai and one of the first statues of British era to be moved out. !! Were the Public so interested in donating funds to have a statue of this man would remain a moot Q !! – web searches reveal that H.T. Boddam did stir up many things during his tenure and no. of judgements were preferred to be challenged and reversed by Higher Courts too. One kind reference on him is his association with the Madras Pinjaraople. The man who unveiled - Arthur Lawley, 6th Baron Wenlock, (1860-1932) was a British soldier and colonial governor who served as the Administrator of Matabeleland, Governor of Western Australia. 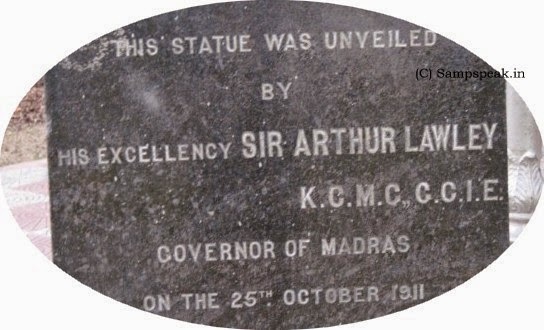 While serving as Lieutenant-Governor of Transvaal, Lawley was appointed Governor of Madras in 1905 at a monthly pay of Rs. 10,000. Lawley's eldest brother Beilby Lawley, 3rd Baron Wenlock had also served as the Governor of Madras from 1891 to 1896. During his tenure, the Madras Estates Land Bill was passed. In 1906, the Arbuthnot Bank of Madras crashed precipitating one of the worst financial disasters of the 20th century. Lawley, who was himself one of the stockholders, tried to raise public funds to rescue investors. Lawley introduced the Morley-Minto reforms and appointed the Maharaja of Bobbili to be the first Indian to have membership of the Executive. The newly constructed building housing the Government Museum, Chennai was opened by Lawley in Sept 1906, the Victoria Memorial Hall. Some web reports suggest that Boddam retired unsung, took Bombay Mail to catch a ship but died on way, brought back and buried in Madras. The statue of Boddam which is now in Napier Park may be removed once Metro Rail acquires this place to be used as a stockyard. The Chennai public who seemingly care little, may not be concerned about this. The Madras Pinjarapole on Konnur High Road, Perambur was founded on his suggestion responding to a plea from the Society for Prevention of Cruelty to Animals. Several public meetings organised by SPCA generated income and leading Gujarati merchant princes donated liberally to the cause. The Madras Pinjrapole came into being as a charitable society with the objective of providing shelter for the aged, Infirm, worn-out and unserviceable animals, which are quite unfit for further work either due to old age or other causes. Animals admitted into the Pinjrapole were maintained till they died a natural death.